Over the years, Superman's level of power has fluctuated perhaps more than any other hero's — he's gained them, lost them, grown weaker and stronger pretty much from the moment he was created, culminating in the addition of a new power last week. Here's your guide to the Man of Steel's power creep. It might be surprising to learn after decades of being used to the vast powers Superman is capable of now, but when he started off in Action Comics, Clark Kent wasn't actually all that powerful in the grand scheme of things. Many of what are now consider to be Superman's most iconic powers — his heat vision, his freezing breath, the ability to fly and even venture out into space — were not part of his power set when he started out in the Golden Age. In fact, as the very first page of his very first story shows above, his only real power is an enhanced strength and physicality that granted him the ability to run faster than a speeding train, lift incredibly heavy objects, and (very specifically) leap up to the height of 1/8th of a mile. It's surprisingly grounded for the Superman we've come to know over the years — even to the point that the writers openly drew parallels with insects on Earth that could perform similar feats despite their tiny stature. Even the 'yellow sun' aspect of Superman's power acquisition, so integral to the character today (even Man of Steel played with it) didn't exist, Superman's strength was just something natural to all Kryptonians. But even at this point, Superman's writers were concerned with his overtly powerful stature - Kryptonite would be introduced in the late 1940's as a way of situationally depowering the hero to create more interesting challenges. As we all know, even this relatively mild version of the character would change soon enough. As the Golden Age of comics gave way to the Silver Age, much of what people now recognise as Superman's iconic traits, and his powers, began to emerge. As writers retcon in Superman's symbiotic relationship with the solar energy from out Solar system's yellow sun, Clark's powers begin to rapidly increase in potency. Instead of being able to only jump high, he can now actually fly, eventually expanding to the point that Superman could even travel on an Interstellar scale. His superspeed begins to almost rival (but never beat) the Flash's own power. The X-Ray vision introduced in the 1950's when Superman first encountered other survivors of Krypton's destruction is enhanced with the ability to see things on a telescopic and microscopic level, as well as of course his now iconic heat vision. His equally iconic freezing breath is introduced too, as well as his ability to hold it indefinitely for traversal through underwater and airless environments. But it's not just his already active abilities that receive a boost; in almost every single aspect of his being Superman becomes super-enhanced. 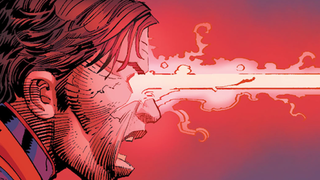 Clark becomes super-intelligent and gains an eidetic memory, even to the point that he can exhibit psychic powers like hypnotism and telekinesis, as well as indefinite stamina (as long as he can be sustained by the sun). His hearing and vocal chords become enhanced to extremes as well, and so does his body, gaining a healing factor (one that fluctuated often as and when writers needed it) and even nigh on invulnerability — over the years Supes has survived multiple nearby atomic explosions and come out relatively fine. The Silver Age sees Superman become not just a superpowered hero, but a super being. This is also when you get to see the proliferation of some ridiculous powers for Superman — he basically became a walking macguffin, with powers revealed as and when they when they were needed for some of the most banal situations. It's where you get infamous, stupid powers like Super-weaving, Super-ventriloquism, Super-mathematics and even the ability to LITERALLY SHOOT TINY VERSIONS OF HIMSELF OUT OF HIS HANDS, as you can see in the picture above. 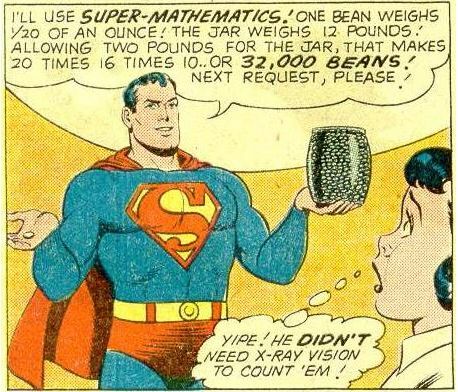 Yes, at one point being really really good at Maths was part and parcel of Superman's grossly overstuffed toolkit of powers. But the '80s, DC — and specifically writer John Byrne — realised that Superman had gone too far. Too many powers, and not enough flaws, had left the character as a joke, one that was difficult to write challenging, engaging stories for. It's a reputation Superman still carries even today in the public consciousness. What's interesting about a character who is basically invulnerable and all powerful, with pretty much only a single, relatively avoidable manufactured flaw? Even Kryptonite had become almost worthless, with Superman's constant exposure to it over the years, or his proximity to the sun, being used to show him able to counteract it. Cue the epic DC crossover story line Crisis on Infinite Earths. The year long saga would essentially become the catalyst of Byrne's soft reboot for Superman — there was a much closer emphasis on Superman's relationship with yellow sun energy, but unlike the Silver Age where it was used as an excuse to amp up Superman's powers to increasingly overwhelmingly epic levels, here it would be redefined as almost a weakness rather than a boon. Superman would have a base level of power, significantly curtailed and trimmed down from the height of the Silver Age's almost ludicrous ostentatiousness (he retained many of his 'new' physical abilities that now sat at the core of the character, such as heat vision, the freezing breath, the ability to fly, but much of his 'passive' skills, such as his speed, stamina, invulnerability and intelligence were brought down to more manageable levels), one that could be gradually built upon the longer he was exposed to solar energy. Byrne also sought, just as Superman's original creators did, to rationalise many of Clark's powers with at least a more logical background: his ability to fly and lift heavy objects while flying were now explained as 'tactile telekinesis' — a subtle telekinetic field generated by Kryptonians that could encapsulate other objects when they were touched, allowing Superman to manipulate them through sheer willpower. But as the years went by, and after Byrne stopped writing for the character, Superman's powers slowly increased again over the 90's and 00's - nowhere near the extent of the Silver Age's most extreme increases, but enough to the point that the character would be once again be dogged by detractors as being too super for his own good. And so we fast forward to today. Well, last week actually, when in his latest story arc, Superman develops a brand new superpower for the first time in years, rather than the mere reacquisition of some of his old powers — and as our sister site Kotaku noted, it actually goes a pretty long way in giving a more human edge to Krypton's last son. Superman's new 'Super-flare', described as a natural evolution of his heat vision by Batman, allows Clark to expel all of the solar energy stored in his body in a giant, flashy and explosive aura, levelling everything around him within a quarter-mile radius. But doing so puts Superman at a disadvantage he's never had before: for 24 hours following his use of the flare, he's completely powerless. It's obviously nowhere near the level of reboot that Crisis was for the character, but it's nonetheless an interesting way of adding a flaw to Superman, and opens up a lot of interesting characterisation. It's essentially the nuclear option, a last gasp attack to take out an opponent that ultimately leaves Superman completely vulnerable for a lengthy period of time. It grounds the character (literally, as he can't fly any more!) in a way that he basically becomes a well trained human fighter for a day after using it - and while Batman proves that's no bad thing, for Superman it's completely out of the norm. It strikes the balance between keeping Superman the epitome of superpowered shenanigans, and keeping him more relatable to comic readers. Above all, it keeps the character interesting — something that, as we've seen, the ebb and flow of his power levels can have a negative impact on.